Rana Creek provided living roof design consultation, construction coordination and landscape installation services for the 13,000 square foot intensive living roof at 899 West Evelyn, an infill office building in downtown Mountain View. Rana Creek worked with Bionic to create the most resilient landscape possible, utilizing native species well-adapted to the site and its environment, and growing many of the plants required for the installation at Rana Creek Nursery. The site features native perennial, succulent, and grassland gardens framed by curvelinear seat walls, an ipe deck with shade trellis, a small undulating lawn, and a bocce ball court. 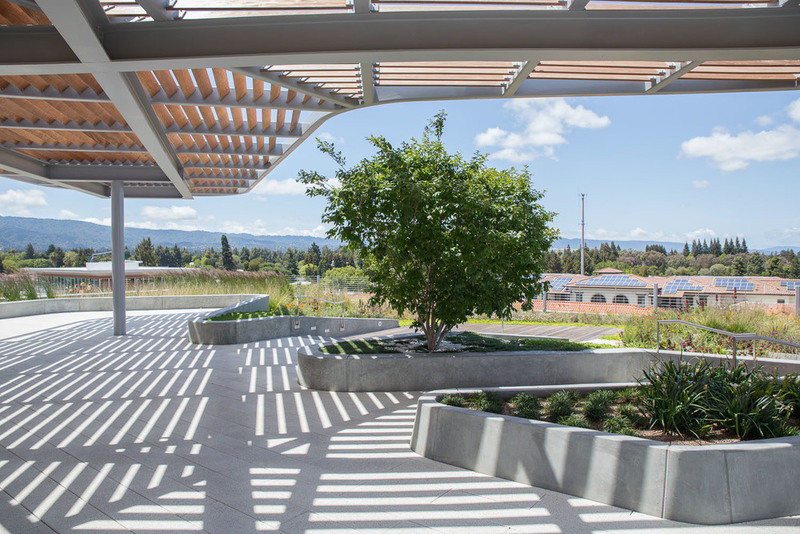 This rooftop landscape offers a nourishing natural space and significant amenity to the building’s users, and creates a patch of habitat for birds and butterflies within the urban matrix of Silicon Valley.